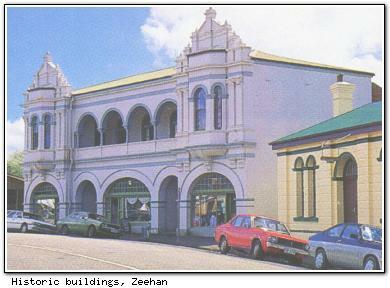 Zeehan (pop ~1200) is 30 min drive from Queenstown in Tasmania's west. Silver-lead deposits resulted in a boom period for the town late last century; at one stage it had a 26 hotels and a population of around 10,000, making it Tasmania's third largest town. Today, Zeehan lives on mainly through the local tin mine. Historic buildings from the boom period include the Gaiety Theatre, at one time the largest theatre in Australia. The West Coast Pioneers' Memorial Museum has mining and railway displays, including one of the best mineral collections in Australia. Granville Harbour, west of Zeehan, was founded after World War I and is now a holiday town where west coast residents keep holiday shacks. The harbour offers excellent fishing, and there is also trout fishing on the Henty River south of Zeehan. It is possible to walk along the old mine railway from Zeehan to Queenstown. Zeehan was named after the ship of Abel Tasman, Tasmania's European discoverer. It has two 3½-star accommodation facilities (RACT rated).